Educational institutes across the city are shocked after the latest National Institutional Ranking Framework (NIRF) 2017 data came out on Monday . The Indian Institute of Technology-Bombay maintained its second position among engineering colleges, but the Institute of Chemical Technology dropped from 2 to 25 as a university . Veermata Jijabai Technological Institute (VJTI) does not figure among the top 100 and Tata Institute of Social Sciences (TISS) enters the charts at 49 in the overall rankings. St Xavier's College is ranked 40th among colleges and five of the city's management schools have made it to the top 50. The Indian Institute of Science ranks first, followed by IIT-Madras and IIT-Bombay in the overall NIRF 2017 rankings.Scores for teaching, learning and resources, and graduation outcomes pulled IIT-B's rank down. It did well on parameters like research and professional practice, outreach and inclusivity, and public perception. “It is a matter of great satisfaction for IIT-Madras that it continues to be ranked number 1 among engineering institutions in the country . We have improved our performance on most parameters, and quite significantly too on some key ones,“ said Bhaskar Ramamurthi, director, IIT-Madras. Many from the city felt there were issues with the scoring.ICT director G D Yadav said he needed to analyze the data before he could comment on the college sliding down the ranks. “I think among their criteria, central institutes and the population of students has been some of the important considerations. Also, I feel the marks have not been normalised,“ said Yadav . Started in 2015, NIRF outli nes a methodology to rank educational institutions across the country . The parameters used for ranking broadly cover teaching, learning and resources, research and professional practices, graduation outcome, outreach and inclusivity , and perception. Although the broad parameters remained the same this year, there were significant changes in some of the sub-parameters. Also, besides ranking institutions under specific disciplines as done last year, every large institution has also been given a common overall rank this year. In Mumbai, another of its top engineering colleges made it to the rankings -National Institute of Industrial Engineering. Sardar Patel College of Engineering, VJTI, Fr. C Rodrigues Institute of Technology , Navi Mumbai; and Fr. Conceicao Rodrigues College of Engineering are on the charts. P Sawant, principal of Sardar Patel College, said the quality of students, the efforts invested by faculty and the research conducted was what saw the college among the top colleges. Among the city's general colleges, three applied for the rankings -SIES, Sion; St Andrews, Bandra; and St Xavier's College. St Xavier's principal Fr Agnelo Menezes said autonomy has got them this far.“Not a single non-autonomous college has made it. But we got badly hit in research and that is bound to happen as we are largely an undergraduate college and there is no great research taking place,“ he said. 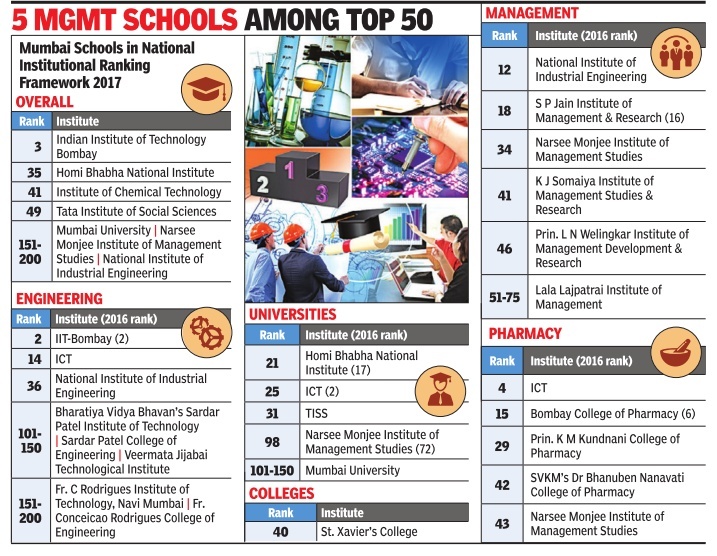 Within the top 50 on the management list were five from the city -National Institute of Industrial Engineering, S P Jain Institute of Management & Research, Narsee Monjee Institute of Management Studies, K J Somaiya Institute of Management Studies & Research, and L N Welingkar Institute of Management Development & Research. In the 51-75 band was the Lala Lajpatrai Institute of Management. Conspicuously missing was the Jamnalal Bajaj Institute of Management Studies. Mumbai University was placed in the 151-200 band in the overall rankings, and -embarrassingly -among 101-150 even on the universities list.The Internal Quality Assurance Council of MU is having a relook at the data submitted to NIRF . “We are sure of our performance,“ said PRO Leeladhar Bansod.